Golden Gardens Beach, Seattle, Washington. This will be a departure from my typical post to provide some first person social commentary on the single life of a single guy (me). Commentary, not an indictment of anyone in particular. I'll try my best to avoid sounding bitter, which might be your natural assumption. This really isn't about any one person or event in particular even though specifics will be named. A couple nights ago, when I got to Seattle, Pentz and I hit a couple bars around the Seattle U campus. Naturally we struck up conversation with Seattle U girls. And by the end of the night hatched some loosely made plans to drive to Vance Creek and stand atop the 2nd tallest bridge in the U.S. (with the advent of social media, the Vance Creek Bridge has become a photo hot spot because of the impressive scenery/impressive drop). So stop right there. This is not my first rodeo. I realize as an out of towner passing through, these plans probably have a 25% chance of getting off the ground. And that's cool by me. The girls were cool, and I'd love to see the bridge. But in the big scheme of things, these plans in particular weren't going to make or break the trip. 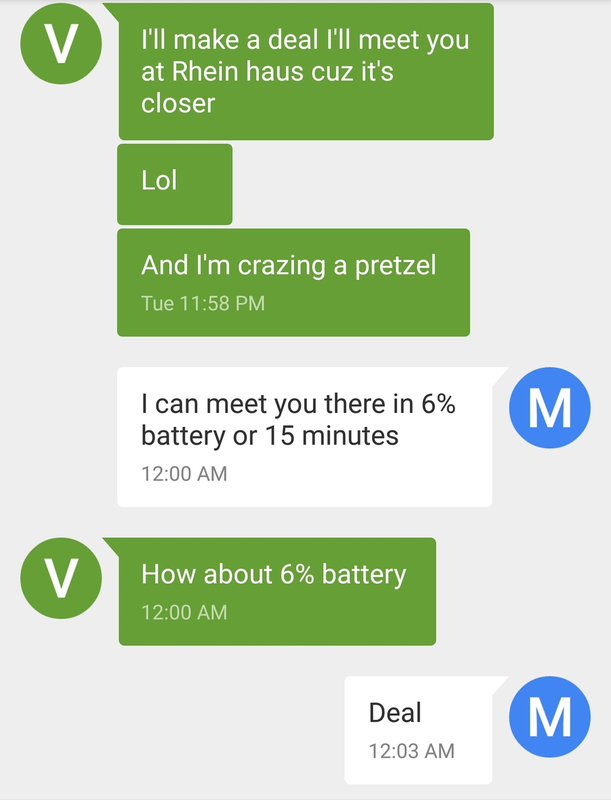 Knowing the odds, I left it to the girl in this story to text me. We'll call her "V", which isn't even a letter in her real name. Boom, boom, one-two punch with strep throat and major housing drama on a Tuesday morning. I don't doubt it's all true. Just as part of the commentary, the plans are never just cancelled. Despite the cancelled trip, I stuck with the conversation, because yeah, if she could meet us out for a drink, that'd be just as good. She is a pretty girl with a good story. But that's where it gets tricky in today's day and age. Because you'd be hard-pressed to find a girl who will say anything but maybe. Whether she thinks you're a creep or marriage material, whether she intends to actually come or not, she'll probably say maybe. In that context, "maybes" can seriously complicate things. How many maybes to the end of the rainbow? I had to find out. Kind of an aside, this game is easier as an out of towner. Because if you're local, there's a natural tendency to take your foot off the gas and go with a passive approach. You can collect maybes for weeks? Months? I've taken the passive approach as a local many times before. Which really is a nothing to lose approach if you're not sure if this girl is even girlfriend material. The passive approach can get ugly though, because after enough maybes, if you really do want to see this girl, you try and force the hand for the first time in the back and forth. Is this girl actually busy or is it impossible for her to say no? Be ware, being assertive after passively accepting too many maybes can paint you in a passive aggressive light; as I learned after my only Tinder date turned into a second date, then a third almost date that after several weeks got downgraded to never. Somewhere between next weekend and never, I jumped the gun on maybes. In hindsight, I'd walk 500 miles for a redo with that girl (and I would walk 500 more). Back to the story, I wasn't taking maybe for an answer last night. It was no or bust. A girl buying a fan after 10pm in April? That answer may phase a younger man, but not the 26 year old single man. Would you rather is one of my favorite games. Another plot twist with the exam. V and I closed the bar down. She's awesome. But walking her home I found out she apparently has a boyfriend. My kiss caught cheek. And we went our seperate ways. No time wasted. Just another case of guy misreads girl. No hard feelings. You'd think that would've come up in conversation. Right? A couple Valentine's Day's ago I asked a girl that I had just met what her plans were for the Valentine's Day weekend. When she said "nothing", I incorrectly assumed that meant single. One ex-boyfriend and a couple +1 wedding invites from her later, she also neglected to mention that somewhere in between she started online dating this guy I knew who lived at least 1,000 miles away. We're all people, subject to the influences of place and time. Tonight's Fort George Suicide Squeeze is dedicated to the games people play. Fort George is a brewery located in historic Astoria, Oregon, 5 miles northeast of Lewis and Clark's landing at the Pacific Ocean.